View More In Lumbar Supports. Thoracolumbar Spine Orthosis - a Back Brace for the SpineThe Cyberspine Thoracal Lumbar Sacral Orthosis (TLSO) is a unique back support that is designed for back pain specifically located in the spine. The design doesn't allow movements that could cause further pain in back with its superior stabilization and control.Features of this Thoracic Back Brace Providing Treatment for Back PainLike most Cybertech braces, the Cyberspine utilizes the pulley system that allows patients to easily adjust the compression and comfort of the brace to best prevent back pain. Soft padded liner is removable for a sleeker fit and to extend Cybertech's promotion of usability. The shoulder straps and pads located around the neck are adjustable and built for the most comfort possible. The sternal pad around the neck and the extended chair back design provides extra stabilization and posture to prevent further damage to the spine. The cutout area in the spine area of the back support provides extra comfort and relief to the spinal column. Cybertech Lumbar Brace - a Lumbar Orthosis for Back PainThe unique design keeps the spine stabilized and restricts movement, making the Cyberspine useful for just about any back injury:The Cyberspine LSO creates postural alignment like no other brace thoroughly keeping the spinal column stabilized and correctly positioned. 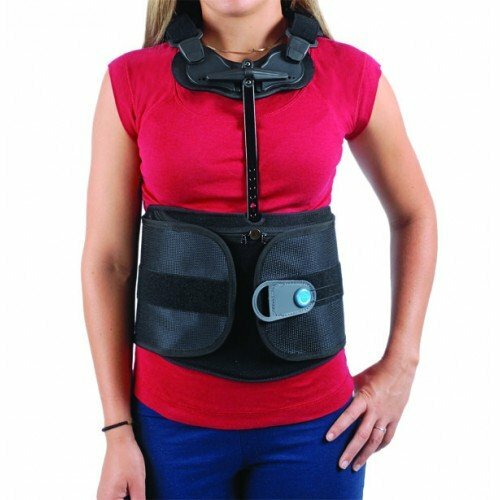 This lumbar orthosis back brace also helps in the early stages of osteoporosis in the spine. The thinning of the bones leaves pain and weakness that must be supported. Also capable of providing the immobilization necessary for fractures whether it is lower back pain or higher up in the spine. The larger design and connection between the abdomen and neck provides complete stabilization. Kyphosis—the forward rounding of the upper back is corrected by the Cyberspine with its design of keeping the back straight and comforted. Helps fight lower back and spine pain. If you have any questions about this product by Cybertech Medical, contact us by completing and submitting the form below. If you are looking for a specif part number, please include it with your message.